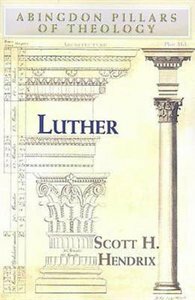 About "Luther (Abingdon Pillars Of Theology Series)"
Scott H. Hendrix (Dr.Theol., University of Tubingen) is James Hastings Nichols Professor of Reformation History and Doctrine at Princeton Theological Seminary and an ordained minister in the ELCA. He is the author of Tradition and Authority in the Reformation and Luther: Abingdon Pillars of Theology. He serves on the editorial committees of Studies in the History of Christian Thought, Archive for Reformation History, Sixteenth Century Journal, and Lutheran Quarterly. Koorong -Editorial Review. According to Eberhard Busch, Karl Barth's theology is "characterized by being...in constant movement and transformation." And a Christian's path is marked by self-correction in order to learn how to live out the same thing again and again in a better and more appropriate way. Likewise the church, like her God, is always on the move. "The author of a masterly biography of Karl Barth, Eberhard Busch brings the rich detail of Barth's life and era to bear on Barth's theology. Unlike some other introductory texts on Barth, Busch's Barth draws on the full range of Barth's work. Each chapter concludes with provocative and insightful questions, making this book ideal for study groups. The joy of Barth's theology shines through on every page here a fine introduction to the 'joyful partisan of the good God'! "Eberhard Bush is the acknowledged dean of contemporary Barth scholars. No one knows Barth's life and work more closely than he. He now gives us the most lively, engaging and perceptive study ever written in a short book on Karl Barth. Highly recommended, especially for beginners. But even those who know Barth well will find much to appreciate.